What caught my interest today was an article on the Lake County Tea Party site by Paul Mitchell about Grayslake Unit School District 46. 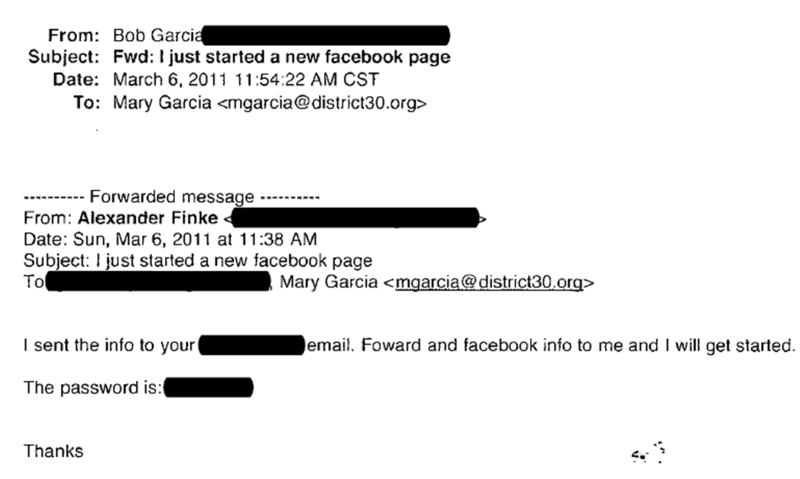 It is based on emails sent to and from the school district’s email server and shows the planning and execution of the re-election campaigns of incumbent school board members Sue Facklam and Mary Garcia. I dipped into the email source documents (which can be accessed at the bottom of Mitchell’s article) obtained through a Freedom of Information request and found some that I would like to share with you. In long, long documents like state budgets, I start at the bottom and work my way up. That’s works for budgets, because legislative leaders often bury bad things near the end. It works for emails because the last one sent responsive to the FOI request is on the bottom. For you though, I’ll put them in chronological order starting about two months before the April 5, 2011, election. 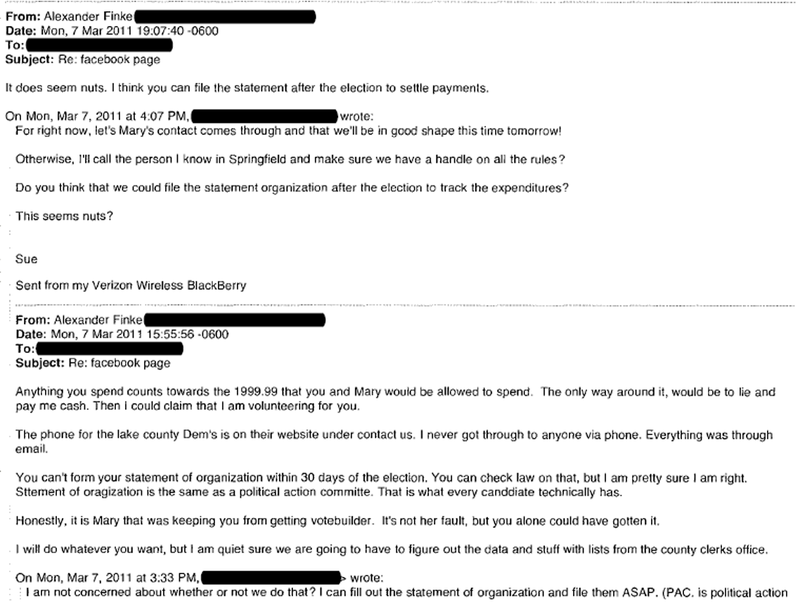 This March 1st email from incumbent Mary Garcia to consultant Alex Finke seems to give advice on how to evade the Illinois Campaign Finance Disclosure laws. This email from incumbent Sue Facklam tells of how gift cards were give to high school students who registered to vote. She notes that practice "is probably illegal." 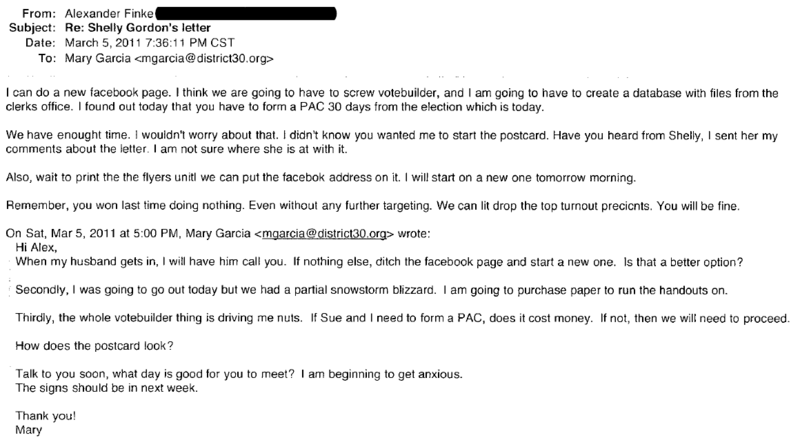 This email tells how the incumbents reached out to Lake County Democrats for data base help. A retired teacher apparently sent a letter to the editor. The reaction was to try to find out how much of a salary bump he got before retiring. Teachers are filling out "friend-to-friend" post cards. The union will pay postage. Lake County Democrats are unwilling to share Votebuilder because Mary Garcia, one of the incumbents, did not vote in the Democratic Party primary election. "You won last time doing nothing." Campaign FaceBooking about noon at school. Here's a campaign appearance invitation. "Is it illegal for me to forward this??" asks Diane Elfring, the District 46 teacher union president. The Patf's Pizza fund raiser does not have the required campaign disclosure telling where one can purchase a copy of the political action committee's campaign disclosure report. What follows–in two parts–is an email telling how a joint campaign might avoid filing campaign disclosure reports. The local library's email seems to have been used for political purposes. Once again, thank you for the sunshine! 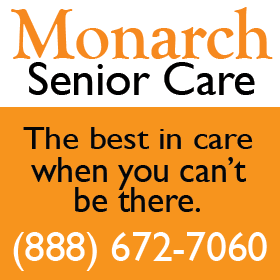 It is greatly appreciated and extends far beyond the borders of McHenry County. 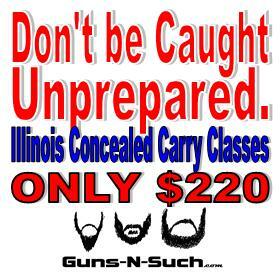 Do Democrats know that no one in Illinois is going to prosecute them for illegally doing things politically? They are probably safely assuming even the Feds won’t arrest any of these individuals or union teachers for illegally breaking the law. It’s disturbing that people like this, along with the teachers’ union, are setting policy that has little to do with a better education for our children but more toward increasing salaries and benefits for teachers. Daily Herald reports on this matter. Grayslake District 46 officials accused of improper political emails. Political emails sent on public system at issue. 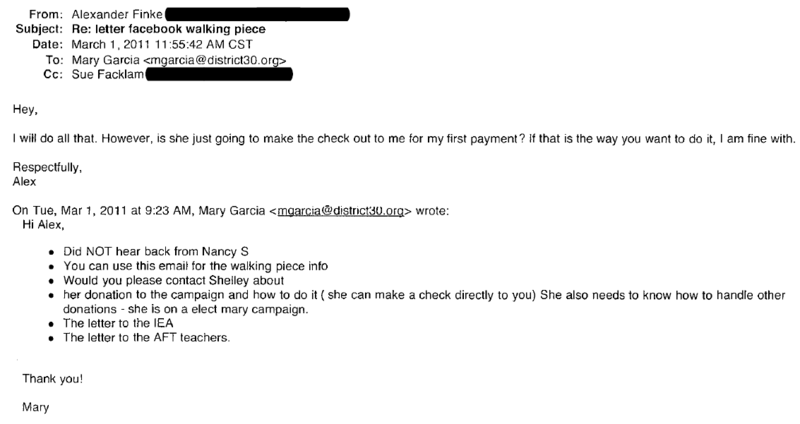 So, if I have this right, Mary Garcia was recently the board president in District 46. Elsewhere, I read that she is also a union president and employee at District 30. I soooo look forward to what Cal has to say in his 2nd piece. Until then, I hope that the public becomes more and more aware of the way things can be stacked against them, their wallets and their children’s piggy banks. Ex. – It’s not unusual to have a union person or a politician shout to the heavens that teachers pay their (stated by law) 9.4% of their own bucks into their TRS pensions. They shout this to the heavens like it actually means something – knowing full well that it’s common for school boards to “assume” the teachers portion. In other words, teachers usually get their regular raises and then get additional money to pay toward “their” contribution. What’s really happening is that the Taxpayers are often also paying even that minimal 9.4% “contribution”. And the nonsense about the teachers paying the 9.4% is another example of “honesty” to our children. The above statement is incredibly misleading by result, if not intent. Unless the proportion of employer paid retirement changes from year to year, an X% increase is an X%. Now in a district like 158 where the practice was just implemented in the last contract, the cost increases were properly stated inclusive of all components of compensation. So, when you heard that teacher got a raise. It was all in there. There was no hidden cost, no secret stash of a raise. It was all out there in the open. There no “additional money”. If someone thinks the costs are too high, no problem. Everybody gets an opinion and a vote. The issue of total cost is rarely if ever raised. It is not mentioned at all here. Here we have a crusade against a specific structure of compensation. This irrational conceptual tirade against the employer paid retirement defies logic. Of course, taxpayers do and should care about total costs and increases in total costs. That makes sense. However, nitpicking at the manner of payment makes little to no sense. It is a bogus setup to create an illusion of MORE. How many people care if a public employee makes $100 of salary and contributes their own $9.40 pension or if the person makes $90.60 in salary and the employer pays $9.40 to the pension? What upsets people is this false impression that they are getting $109.40 because the employer pays the contribution. This is the same bologna “you may want to know” tried to pull by pretending that the salaries listed on the school district report cards didn’t include the employer paid pension numbers when they in fact did. Whatever Mike Laird is crabbing about has nothing to do with Cal’s article or the facts in it which seems to show that teachers are illegally doing political work and payments. Many people think it is absurb they have to pay 6.2 percent of their pay into Social Security while teachers pay zero of the 9.2 percent, by law, they are supposed to be paying into TRS. I wrote 9.2 percent when it really is 9.4 percent, by law. A 9.2 typo. You may … read For Dee and Alan’s post which I quoted. My response was pretty clearly a direct response. People also probably think it is absurd when people such as you and for dee who both actually know better negligently and intentionally misrepresent the arrangement as if it were additional compensation instead of the agreed upon split up of the compensation that it truly is. Why do you repeatedly and knowlingly misrepresent facts that you know are not accurate? Getting a little off track, but let me address this issue of 9.4 percent and for that matter the entire compensation of teachers as it applies to McHenry County School Districts. Each district is unique. Many people are incredulous that some school districts pay the employee 9.4% pension contribution, on behalf of the employee, to the TRS pension fund. In addition to the employee getting a 6% raise each of the last 4 years of employment for 24% raise over 4 years. In addition to the starting pension calculation of 75% of average of last 4 years salary. In addition the pension is increased 3% annually after retirement. In addition to allowing employee to exchange unused sick leave for money upon retirement and allowing that to count towards pension. In addition to Collective Bargaining Agreements covering multiple years, but if the economy tanks, the union votes to lay off teachers instead of freezing pay. Obviously that doesn’t happen in all districts or all times but it has happened and it’s no uncommon. Yes sometimes the agreements are frozen, but sometimes it’s lanes only, sometimes, it’s steps only, sometimes it’s a freeze to an increase to the entire schedule, rarely is it a freeze to the 6% end of career salary increase, and I have never seen a 100% freeze. If you track compensation and benefits over the last 10 years you will not see many freezes and you will see compensation and benefits that has far outpaced the private sector. And heaven knows what other perks. Let me be clear for the teacher who decides to say, that’s not true in my district. Not not all districts allow all perks. However all districts allow some perks that the private sector is not getting. If the taxpayer wants to learn the perks, the taxpayer has to read the 60-90 page collective bargaining agreement. That’s if the taxpayer even knows there is a Collective Bargaining Agreement in the first place, and if they know it’s required by law to be posted on their District’s web site, and if they know how to read it. No one clearly discloses this to the average Joe taxpayer. It’s not reported in the newspapers fully and completely. Some is reported, some is not reported, never ever is it completely disclosed in detail. Neither the Board, Administration, Superintendent, nor Teachers Union clearly and easily discloses these details to the taxpayer in a one or two page fact sheet. It’s worse than fine print. It’s 60 – 90 pages of print. Unbelievable. So if any teachers want to be upfront, tell us your district name and all the perks including health care contributions, co-pays, deductibles, and coverage. Include all the breaks during the school day your agreement allows. In fact all teachers demand that your union release this information to the taxpayer in a form that is easier to understand than a collective bargaining agreement, so that we can put an end to this guessing game. Back to the Grayslake Elementary District 46 and Northbrook/Glenview Elementary District 30 email fiasco. State law prohibits public resources from being used for political activity. 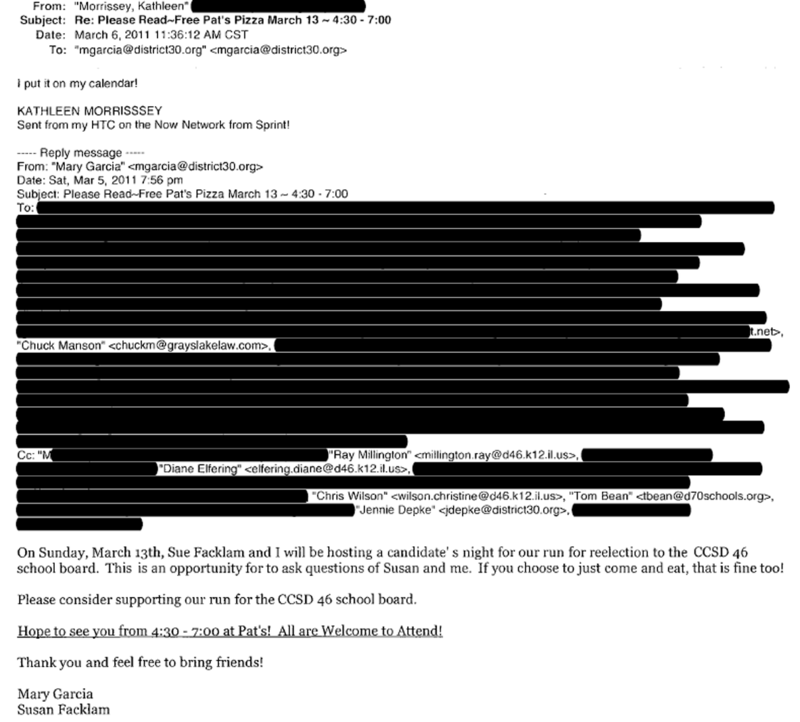 A FOIA revealed that on Thursday March 10th, 2011 at 3:24 PM from District email, Grayslake Elementary District 46 Superintendent Ellen Correll wrote an email to North Chicago Unit District 187 interim Superintendent Douglas Parks on behalf of Mary Garcia (Grayslake District 46 School Board President until she was defeated in the April 5th 2011 election who is also a teacher and union president at Northbrook/Glenview Elementary District 30). “Mary Garcia is wondering how many signs you would take?” Correll wrote to Parks. Douglas Parks is a Grayslake resident that in 2004 retired as Superintendent of Aptakisic-Tripp School District 102 (K-8) in Buffalo Grove at a salary of 236,000 and currently draws a pension of 156,000 in addition to his compensation as interim Superintendent. He is also an associate at the recruiting firm of Harzard, Young, Attea, and Associates. I don’t know why for dee and alan sidetracked the conversation, but here we are. Why would people be incredulous that someone’s salary is lower than it otherwise would be in order for the employer to pay the pension contribution? A total dollar of cost is a total dollar of cost. Is it not? The starting pension is NOT 75%. That is the max after 34-35 years, not bad, but it is a max not a starting point. By “breaks”, you mean non student contact time that is typically spent on job related tasks that can’t be done while teaching students. Do you refer to it as a break when a sales person is not in front of a customer, but working on say a proposal? The 3% “COLA” was enacted when inflation was higher than that often double. It could have/should have been written differently. The plan for new employees addresses that by capping increases at half CPI. I can see where you would be interested in the healthcare contributions, but why the characteristics of the plans? If it costs the district a certain amount that is a manner of compensation, how is the coverage relevant? Looking at total cost makes sense. I don’t get the focus on the details of how it breaks out. If you want to argue total cost vs total value, I get that. Including residual costs like unfunded pension obligations also makes sense. The value of arguing about how the parties divide that agreed upon cost eludes me. The contracts are like anything else in the world, you have to read to understand what is included. Any summary would be attacked for not including some detail that one or another person finds objectionable. On balance, the average Joe/Jane is more than capable of understanding their district’s employment contracts. There are a few exceptions, but very few. Many are long documents. Many are at most half that length including schedules. The original comment included a reference to the Grayslake article and then gave a short example of ANOTHER way the Industry can stack the deck against taxpayers. If pointing that out was somehow hijacking the thread, I should have really gone for it and typed another two or three volumes. Sorry you don’t like the public hearing about this stuff. Once again we appear to be at an impasse. Again, that’s fine with me. I’m not here to convince you and the public is being made well aware of the game playing going on with their taxes. You’re thrilled to be on your side and I’m thrilled to be on my side, taxpayers’ sides, and children’s sides. Talk around what’s going on all you want. Some of us actually know when the Taxpayers are being taken for a ride and it has nothing to do with whether or not we think teachers are “nice”. It has to do with financial reality. Tightening up the chat to the Grayslake political issue – this stands to be an excellent pile of info to spread across the state prior to the next board member elections. AKA – This is what you are up against – you are facing the financial power and foot soldier power of the unions. With rare exception, school board members will, in my opinion, usually come from their preferred pool of mostly Industry biased folks . Also in my opinions and after some interesting experiences and observations, the idea that the board truly represents the public in the community is mostly a fantasy. At this point I’m looking at too many boards that are or are probably just facades. 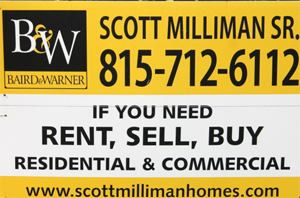 They are often more like unpaid Industry Employees and Salespeople for referendum tax increases and more costly contracts. If a district isn’t performing well there are plenty of ways to shmooze the public into thinking otherwise. That, too, is a whole story in itself. It’s an old game and the Internet has allowed the details to go into the homes of many millions of Taxpayers who can now do what they need to do to change the players and the outcome. The taxpayers are not quite as cowed when it comes to asking questions these days. The days of unquestioning respect for the Education Industry has finally gotten to the point of expecting results instead of pacification, and so on and so on. It would have been wonderful if the Education Industry truly earned all that earlier respect. Sadly, it didn’t. The public now recognizes that it IS a business no matter how many times Educators try to say otherwise. The political stuff going on in Grayslake is another crack in the overall altruistic mask. Again, this has nothing to do with whether or not teachers are “nice” people. Personally, I used to hold the Education world on a pedestal and praise employees like crazy. Those years of not paying attention are over now. 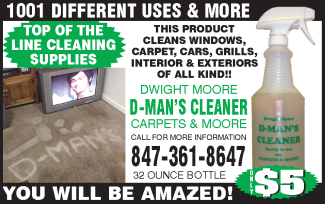 For Dee…You may want to know and Mark incorrectly inferred that the subject departure was my doing. I had no objection to you bringing up something else. I did and do object to one knowingly making clear factual mistatements. You state, not imply that the pension contributions are “additional money” on top of whatever increases when in fact they are part of whatever increases, if any. A percentage is a percentage, not a percentage plus “additional money” in your words. You write about game playing and talking around what’s going on. As far as I can see what I presented is the only factual information in either of our posts. All you have presented are broad based unsubstantiated accusations of game playing in response to real math. If you have an actual flaw or inaccuracy to point out in what I have written, have at it. I am always eager to be educated when I am mistaken. I am sorry that $1 of cost is $1 of cost no matter how you break it up. What it is not is the $1.09 + that you seem to want to present it as. 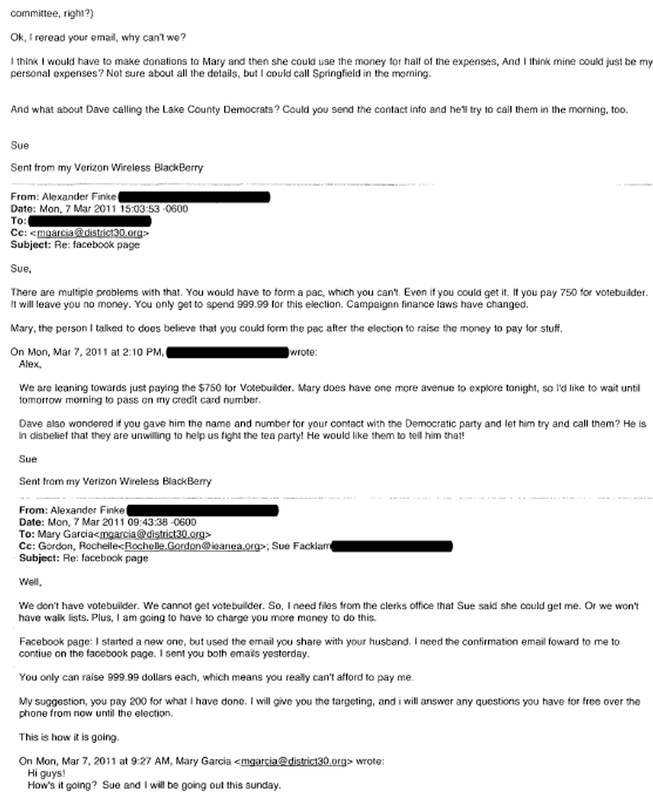 What is also disturbing is that in one of these e-mails, it appears sopmeone named Alexander Finke is touting his ability to get a “back door” discount from people downstate. Which appears to indicate this corruption reaches even further, to Springfield even. This needs to be investigated, but strangely, Lisa Madigan’s office in my requests keeps trying to push of ANY investigation of this, saying it is the Lake County State’s Attorney’s job. So I am sure this goes WAY deeper than anyone knows yet. Someone needs to send this to Channels 2, 5, 7, 9 and FOX. I think what happened is this. 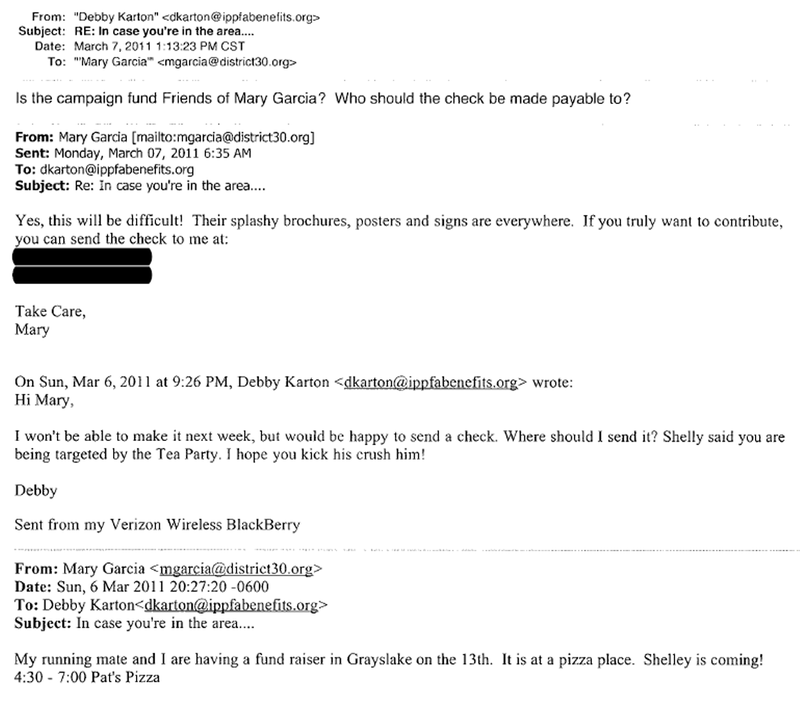 Then, Mary Garcia read that article and sent an email to Bob on March 2nd, 2011. We apparently have an active teacher named Mary going after a retired teacher named Kip because they have opposing views in competing for a school board seat. What was Kips involvement in the union and why would she question it. She herself is the President of the District 30 Teachers Union. Is she, a teacher and teacher union president, insinuating Kip’s percentage increase in wages leading up to or in retirement constituted not being accountable to the taxpayers? What increases is she referring to? Did Kip get the 6% or 20% increase in the last 4 years of his career? How about the percentage increase in wages she will receive leading up to and in retirement, will she consider those as being accountable to the taxpayers? Back to this 9.4% TRS pension contribution issue. In reviewing Mike Laird’s comments. Does this mean when Huntley went on strike in 2008, one of the concessions by the School Board was to pay the employee’s 9.4% TRS pension contribution? Wouldn’t that just by itself be the equivalent of a 9.4% pay increase? Is that the case? Is that what happened? You would have to ask the parties what concessions were made by both sides and when. NOT EVEN CLOSE. The District currently pays 2.5% of the 9.4%. The total increase yr over yr was less than 5.3% each year inclusive of TRS. Increases after a cerain # of yrs were a lower % as is common. So, it is likely under 5% weighted overall. As a refresher, Mary Garcia is a 7th grade Science Teacher at Maple School in Northbrook, IL; which is in Northbrook/Glenview Elementary School District 30. A FOIA request revealed she was sending emails, during work hours using her District 30 email address, concerning her bid to get re-elected as President to the Grayslake Elementary District 46 School Board. Note the following on the District 30 website. 1. No officer or employee shall intentionally perform any prohibited political activity during any compensated time, as defined herein. 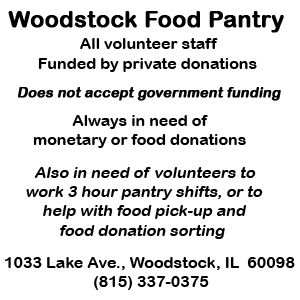 No officer or employee shall intentionally use any property or resources of the Northbrook/Glenview School District 30 in connection with any prohibited political activity. On November 10, 2010, at an open meeting, the Grayslake Elementary District 46 School Board hired Mary Garcia’s husband, Bob, for a job in operations and maintenance at Grayslake Middle School. But although the meeting was open, no one in the audience realized Bob was getting hired, due to the way the District 46 School Board and Administration presented the information.